It's funny how things happen. I had been looking for a work space since May, pretty much every weekend. I was getting frustrated and was giving up hope of being able to find a "perfect" spot. Robert Mahar is a friend I met through Cathy of California. He always comes by during Renegade Craft Fair to say hello and catch up. I mentioned that I had been looking for a new work space and he said that he and his friend Molly just found a great creative office space the Spring Arts Tower. I checked out the website and was interested. I wasn't able to go see it, so Katie went. The spot we looked at turned out to have been in the process of being rented already and I was crushed. I went to talk to the leasing manager again and I'm so glad the first place fell through. This place is perfect! I said I wanted it straightway. I'm so stoked. I can't wait to start working there. But of course I have to pack everything up first! I'm not closing the online shop at all, orders will just be a bit delayed until I get set up. I think I should be set up in within a week of moving. I'm moving back to LA! I moved to Oceanside about a year and a half ago. Tony and I came here for his work, and I decided to go back to working out of the house- we found a cute beach cottage and Paper Pastries moved in. I thought that a three bedroom house would be enough room- it isn't! I am busting at the seams here, and having trouble being as productive as I could be. Since Tony's project is drawing to an end in a few months, I decided to move back to LA early- he'll be up on weekends and he'll be back permanently before I know it! I've been looking for an apt and work space since May. Katie has been so sweet to go around with me. I somehow always happened to set up viewing appointments on the hottest days. Finally we had two dream spots. First up- the apartment. When I walked into this lobby, I was blown away. This is the original subway terminal in downtown LA. It's a historical building and it's so beautiful. I mean, look at these elevators! The lobby is grand in itself. The hallways are filled with light and marble and great light fixtures. I really can't get enough of these light fixtures. A hallway might seem like a dumb thing to be excited about, but after looking at some of the dungeons that we have seen- it makes a huge difference. I couldn't live or work in a dark place. It would depress me. Plus, the cats wouldn't like it. The apartment itself is tops too. I have wanted double sinks my whole life. Also, two giant walk in closets! Some of the places I was looking at were no bigger than this closet. I couldn't be more pleased with this place! Not only am I in love with it, it's the only place I've looked at in the past three months that is halfway acceptable. It's pretty much my dream apartment. I can walk to tons of places downtown- including grand central market which is one of my favorite spots DTLA. Plus, the subway stop is right across the street. The biggest perk of this space is that I can WALK to my work space. Dream come true!! Pictures of the work space up next. It's been way too long since I've sent out a big stack of mail. 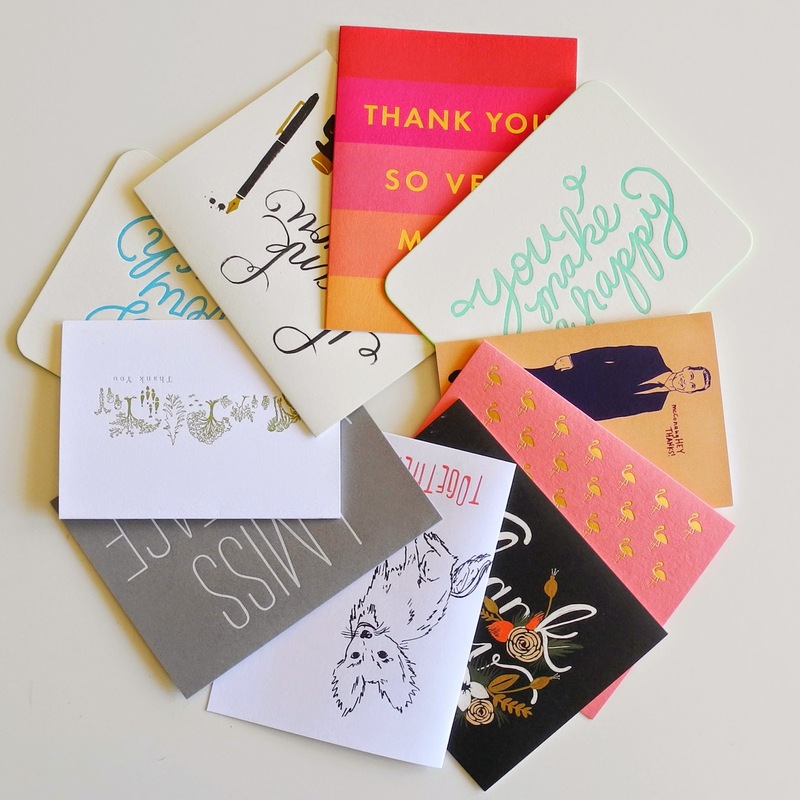 I had a lot of thank you notes to write, plus some birthday gifts to pack. 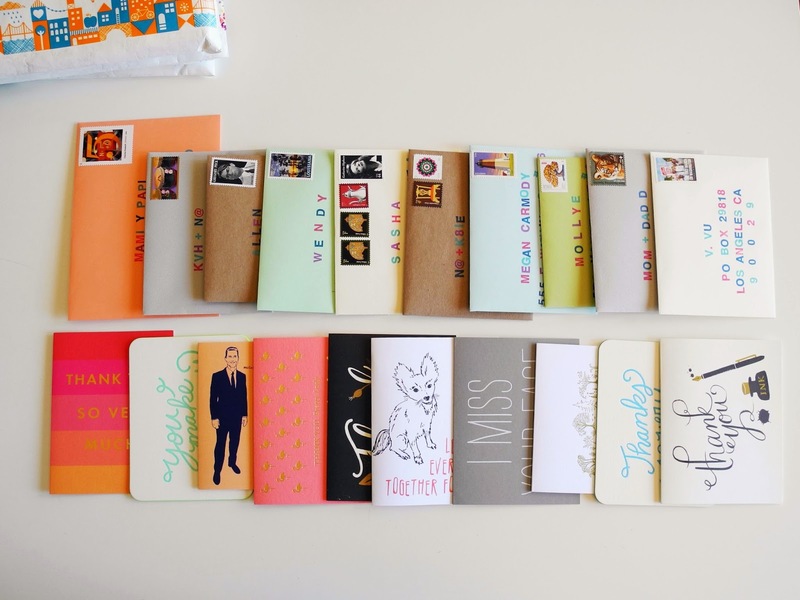 Last week, I took a morning and wrote 7 letters, and 11 cards. I used cards from egg press, moglea, power and light press, rifle paper co, the social type, paper source, quill and fox, and la familia green. I stamped the address for all the cards using my muji alphabet stamps and magenta, turquoise, and neptune inks. 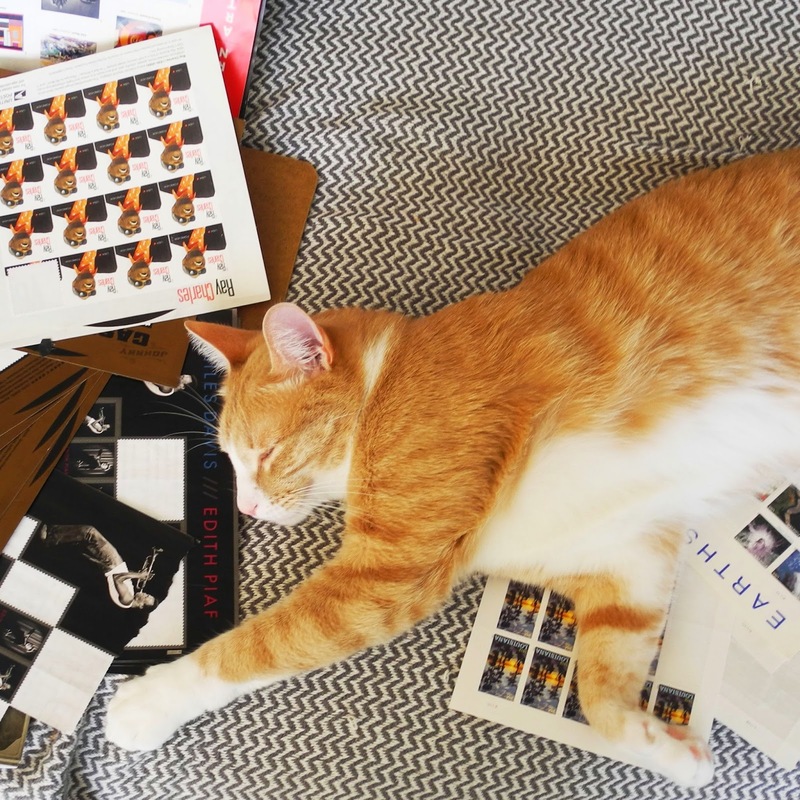 I was trying to organize my postage but Otto decided it was the perfect spot for a nap. 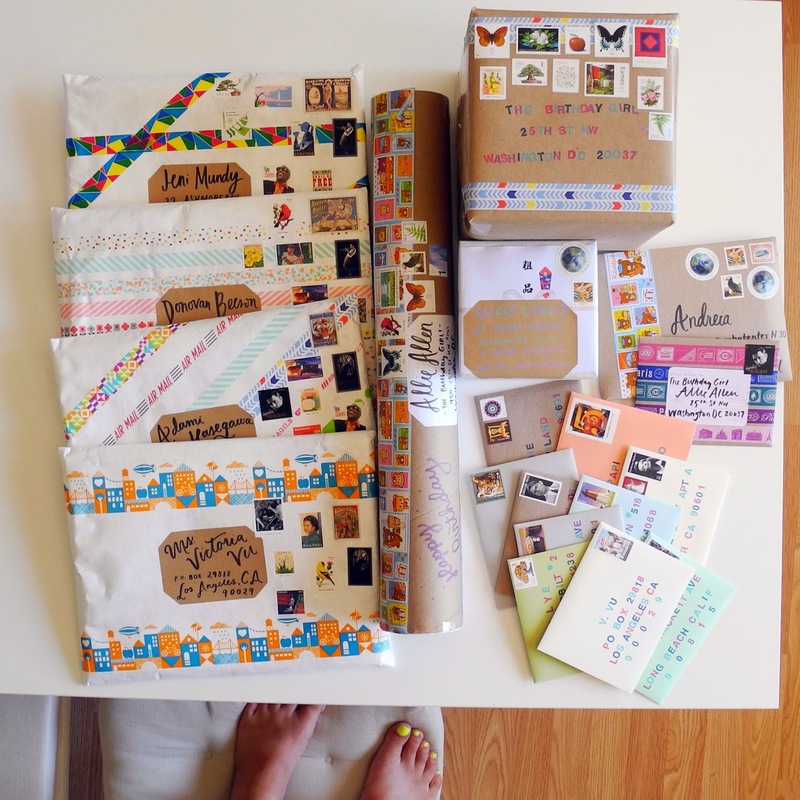 It felt great to send out so much mail. 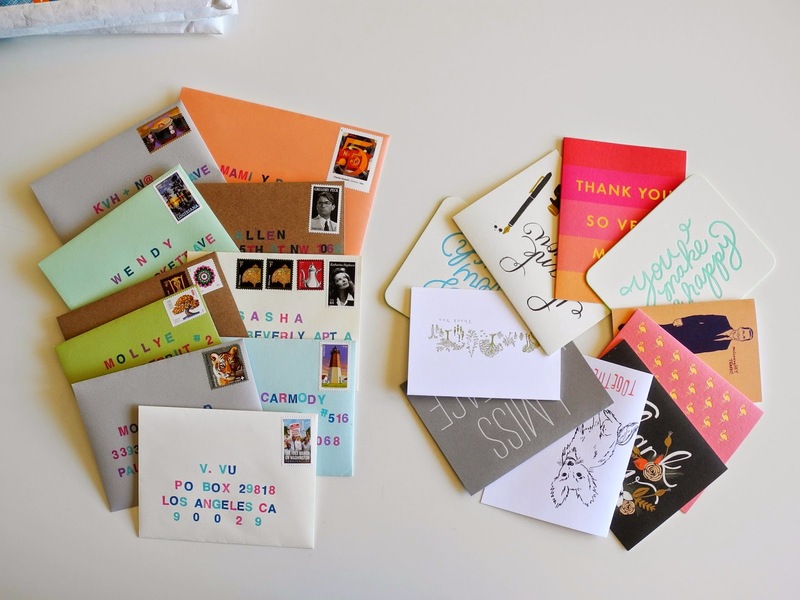 Has anyone written a card or letter recently? The postage stamps have been so good lately!